Reducing water consumption will save your business money and help you operate more efficiently. Being an efficient water user will help you to promote a more environmentally friendly image. 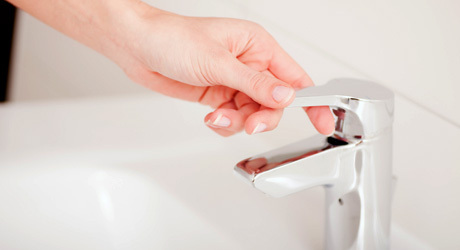 Most businesses are metered so the information on how much water you use will be on your bill. If you are not metered, get one fitted. For more information on metering please contact the Customer Services Department. By monitoring your consumption you will be better placed to highlight unusual levels of water use so that you can take action more quickly. This could save you a considerable sum of money if there is a leak on your system. Consider installing spray type taps and showers that turn off automatically. Consider plumbed in water heaters that provide boiling water for hot drinks on tap. Protect pipe work from damage and frost. 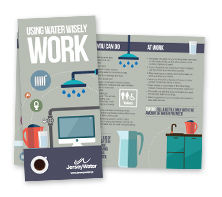 Include polite water conservation notices in toilets, cloakrooms, staffrooms, canteens and visitor facilities and educate staff on how to be more water efficient. Consider undertaking an environmental audit. This will help you to assess whether your business makes the best, most efficient use of water and energy (hot water). Urinal controls can be retrofitted to existing urinals, ensuring that the cistern only flushes during office hours, or after use, rather than continuously. Install rainwater harvesting systems, which collect rainwater from roofs or large paved areas such as car parks. The collected water can be used for toilet flushing or washing vehicles.